If you would like information on growing other popular orchids check out this page. Oncidiums are very pretty orchids and are orchids that will give a lot of pleasure to see them grow and bloom. They are native to the Andes Mountain range in South America. They can grow and adapt to a number of environments at various levels on the mountains. They can do well in the tropical areas at the bottom of the mountains and also survive and thrive in the cloud forests much higher up the mountains. Light: these orchids need bright light, either indirect or direct. They need not to be in the midday sun as such direct light can burn them. If growing Oncidiums indoors try placing them in a a South facing window. Water: when the plants are getting ready to bloom and during the blooming season keep them moist but not wet. Once the growing season is completed then once a week should do. Fertilize: use a balanced fertilizer (15-15-15) during the growth phase before the plants are starting starting to bloom. It is good to alternate during the year, using a higher nitrogen fertilizer during the growth period and then later to shift to one higher in phosphorous to encourage blooming. Remember to use the fertilizer at one quarter or one half strength of the dosage recommended on the label. The adage to fertilize is: "weakly, weekly." Potting: These orchids need to be re-potted only about every other year and this should be done in the spring after blooms are gone. Temperature: Oncidiums are considered intermediate temperature orchids. That is they can tolerate temperatures to 55 degrees F. (13 C.) and highs of mid 80's F. (27 C.). If the humidity is high then they can withstand temperatures even higher, up to 90 F. degrees (32 C.). Humidity: Oncidiums, like most orchids prefer a humid environment, around 50 - 60%. One way to increase humidity in the home and around your plants is to use humidity trays. 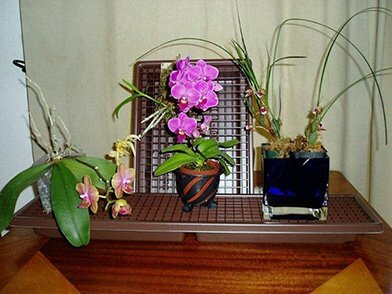 These humidity trays are really cool orchid growing tools. They make it really easy to increase the humidity around your plants. Plus they make it easy to water your orchids in the house and still protect your furniture. 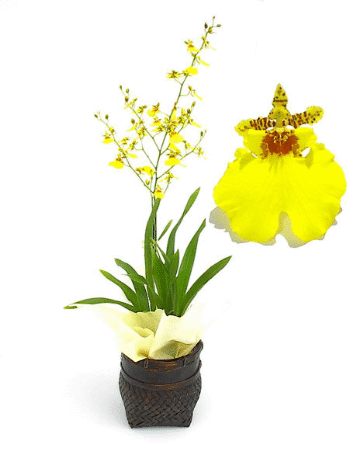 Oncidium orchids make a lovely addition to your orchid collection. They have many flowers, they last usually at least a month and many are brightly colored yellows to brighten up any space. One of them, Oncidium Sharry Baby (a pinkish/brownish one) is extremely fragrant and even smells like chocolate! So please consider learning oncidium care and getting to know these Dancing Ladies better.